Resilience for whom? Women, particularly widows have a different experience of reslience to others of higher standing in the community. Photo: Arlene Bax/Oxfam (from page 16 of the report). This report is based on research undertaken in Vanuatu between 16-27 November 2015, and follows on from fieldwork undertaken a year earlier, during November 2014. Findings and analysis from the first phase were published during 2015 in a joint Oxfam and SEI report, titled “Adaptation and Resilience in Vanuatu: Interpreting community perceptions of vulnerability, knowledge and power for community-based adaptation programming”. As with the first report, the aim of this document is to use themes and critical perspectives from the academic literature to provide insights and alternative perspectives on resilience programming. However, the focus of this report is different, and the findings reflect (and reflect on) the changed circumstances in Vanuatu following Tropical Cyclone Pam (March 2015) and the subsequent El Nino event which has led to significant water stress for many communities. existing community resilience, and how this can be further supported. Analysis focuses on four topics: the significance of differences between social groups in determining resilience outcomes; the nature of local resilience among communities with little or no experience of development interventions; the consequences of development actions for local resilience; and the potential of an alternative framing – resourcefulness – to support a transformation in relationships between communities and different government authorities. Key lessons emerge from this analysis. The fieldwork that underpins the findings in this report was undertaken in November 2015 with communities in the villages of Leitokas (on the island of Malakula), Harald Bay (Futuna) and Tomali (Epi). Leitokas lies on the western shore of Malakula and as such was relatively sheltered from the worst of Tropical Cyclone Pam. Epi lies the closest of the three islands to the centre of the cyclone and experienced significant destruction, as did, to a lesser extent, communities on Futuna (east of Tanna). A further important distinction between the case study communities is the degree to which they have prior experience of development interventions. In this regard, Futuna contrasts sharply with Malakula and Epi. Communities on Futuna have experience of working with development organisations for several years, and in Harald Bay a program of work that CARE International started in 2008 was still on-going during November 2015. These differences allow the main body of the report to explore post-Tropical Cyclone Pam reflections on programming (in Futuna) and local responses to environmental stresses and shocks (in Epi and Malakula). Moreover, these cases allow for comparison between resilience experiences that have been significantly externally informed, and those that are more local or indigenous in character. Focus group discussions (FGDs) and semi-structured interviews (SSIs) were relied on to gather data in communities, with questions structured to explore the main research themes (the ways that programming supported community resilience; the nature of existing community resilience and how this can be further supported). Focus group discussions were relied on to provide a sense of the shared understanding among participants; while this approach necessarily offers insights that are relatively broad (rather than deep), it also provides a setting in which the issues raised can be discussed between participants and responses debated. In contrast, semi-structured interviews were employed to develop a deeper understanding of individual perceptions and experiences. For more information on the case study sites and the methods see the full text. This study has revealed the nature of relationships to be a crucial issue. Individual resilience outcomes are shaped by relations: relations between those with different standing in a community, relations within the private sphere, or via inter- and intra-household relations. In each case, the significance of relations of power and culture has been evident. For NGOs, programming can lead towards relations of dependency, with consequences for pre-existing local resilience. In contrast, resourcefulness demonstrates the need to focus more clearly on the significance of cross-scale relationships for local access to resources. This perspective should help refocus resilience on supporting communities to transform relationships across scales, on their own terms. Focusing interventions exclusively on technical resilience attributes (e.g. flexibility, learning, diversity) will reinforce patterns of vulnerability and exclusion. In the communities that were part of this research, resilience closely follows patterns of wealth and social standing. 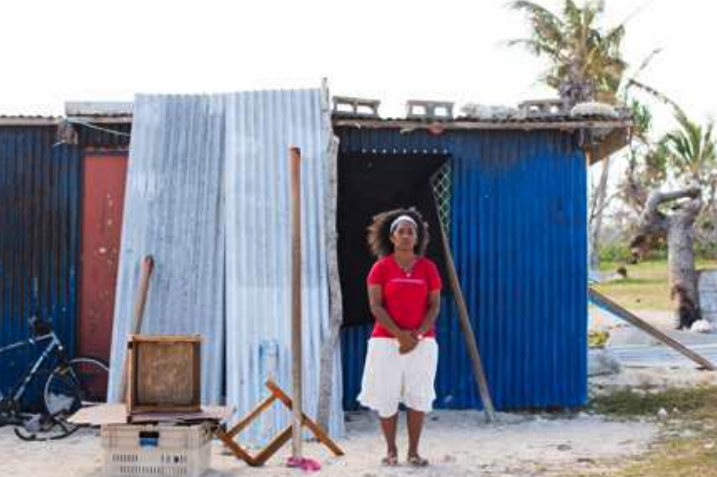 Interventions following shocks such as Tropical Cyclone Pam can amplify differences in resilience and vulnerability. The importance of differences between social groups must not be underestimated. Simply introducing representative community committees is unlikely to be enough to overcome deep-rooted social and cultural differences. Addressing inequalities in the distribution of resilience and vulnerability means exploring and gradually addressing how social difference is reinforced through everyday interactions between community members. Deep rooted norms of gender based violence and exclusion were particularly evident in the case study locations, and need to be addressed if representative participatory processes are to have any practical effect. Isolated communities build their own resilience in the face of challenging environmental and economic conditions, capitalising on relationships with actors at different scales, and sustaining complex and diverse livelihood patterns. Relations of abuse and exclusion within communities have proved resilient to change. Development interventions need to carefully diagnose existing resilience strengths and weaknesses, including social and ecological components, if projects are to provide appropriate support to communities. NGOs must recognise and weigh-up the balance between the value of their support and the long term effects of their presence, ideally looking to develop exit strategies that gradually build effective and mutually supportive relationships between communities and different levels of government. Resilience in and of itself is not a progressive concept; to work towards ending poverty and inequality, it must be married with other development frameworks. Resilience can be – and is – used by some policy makers to avoid accepting responsibility for marginalised or poor communities. Transformation is frequently poorly addressed in development practice. Resourcefulness offers a new approach for development practice, explicitly orientated towards transforming relations of power and influence between communities and government. NGOs and development actors need to recognise the risks associated with promoting a discourse of resilience, and ensure their advocacy does not result in regressive policy. Development programs must guard against synergies that can emerge between the weaknesses shared by the resilience concept and NGO practice in addressing power, politics and transformation. NGOs should explore the potential of resourcefulness to support communities in securing recognition for their interests and a foothold in the contested politics of resource distribution and public policy. Read the full report for further conclusions and recommendations.